Many times Carpet to Tile/Wood Transitions will start to pull away from the hard surface area due to improper installation. Don’t worry. The Carpet Chemist has a solution for these types of carpet to tile/wood transistions issues. We see a lot of cheap transitions every single day that just scream outdated or tacky! You know what I’m talking about. Those gold or silver looking pieces that cover up the carpet to tile/wood transitions. They cost about $10 at Lowes and well, they look like they cost about $10 too. You can often find these eye sores in apartment buildings and old rental homes, but they really just draw attention, and not in a good way. 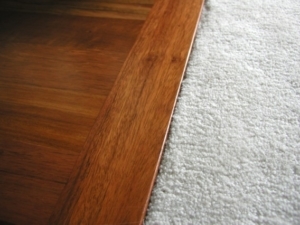 The Carpet Chemist can make a very appealing carpet to tile/wood transitions that flow and are easy on the eyes. Sometimes carpet to tile/wood transitions are necessary for uneven floors, and serve as a safety barrier, such as a rubber reducer or a wood strip, or metal. DIY flooring installers, let The Carpet Chemist add the right carpet to tile/wood transitions for your newly renovated room! Tack Strips.Tack strip installation is one of the most important thngs to remember when you DIY a carpeted room. Tack strips secure the tightly stretched carpet in place, and if done properly, will never come loose for the life of the carpet. Transition Strips.Gold, silver, bronze, colored aluminum transition strips should only be used where the carpet to tile/wood transitions meet, and not where two sections of carpet meet. Rubber Reducer Strips.Rubber reducer strips are generally reserved for commercial carpet to tile/wood transitions. They are a safe and will protect the commercial grade carpeting where it meets the VCT tile floors. Carpet to tile transitions are usually done without a metal strip. We stretch the carpet, what we like to call drum taught, fold the carpet under, then fasten the carpet to the tack strips with a carpet staple gun for a beautiful transition. The Carpet Chemist services a lot of senior homes, and many times the carpet can be a half inch higher than the bathroom tile. A flat metal transition strip is used in these instances as it helps for a smooth entry into and out of the powder room, with the assistance of a cane, walker or wheelchair.